Looking to clean up their neighborhood — affectionately described by some as “trashy, not classy” — Pitt’s Student Government Board is planning to look first-hand at the issues that earned South Oakland that nickname. Along with several other committee members like Wellness Chair Malcolm Juring, Facilities, Technology and Transportation Chair Dhruv Kohli and University representatives such as Associate Dean Steve Anderson, the group plans to look specifically for sections of the neighborhood that lack adequate lighting, clear crossing areas for pedestrians and have high amounts of trash on the sidewalk and street. Dubbed the “Safety Crawl,” which the Student Affairs Committee started last year, SGB’s efforts aim to address safety issues specifically in South Oakland this year after previously focusing on on-campus locations. Because a large number of Pitt students live in South Oakland, Anand said it’s important the area be as resident-friendly as possible. Anand said he sees a litter problem in South Oakland, and he wants to make service organizations and student organizations more aware of the Adopt-a-Block program to clean up the neighborhood’s sidewalks and yards. The Adopt-a-Block program is led through the Pittsburgh Dream Center, an organization that aims to address issues, like cleanliness and safety, that afflict Pittsburgh neighborhoods, according to its website. Dream Center leaders guide a team of volunteers in addressing any basic needs facing a neighborhood block, including picking up trash or mowing lawns. “The Adopt-a-Block system works. It’s just a matter of letting service organizations know about it,” Anand said. The Safety Crawl also plans to look at crosswalks — or lack thereof — in South Oakland. Anand said many streets lack clear crosswalks or signs for pedestrians, making it more dangerous for students to traverse South Oakland. The crawl will start at the William Pitt Union and head into South Oakland from Bigelow Boulevard and Forbes Avenue, ending near Boulevard of the Allies. They plan to address any areas of concern — such as areas with trash pile-ups — that come up along the way. After talking to students after SGB meetings and other events, the Safety Crawl route changed to cover more frequently requested areas and look into more of South Oakland, including Bates and Semple Streets. As indicated by the name, one of the main concerns of the crawl is improving safety for students living in South Oakland. Anand said one fix would be to provide more street lights. In other news, SGB President Natalie Dall, Board members Anand and Arlind Karpuzi and Community and Governmental Relations Chair Nicholas Fisher hosted members of student governments from other state universities for the annual Pennsylvania Association of State-Affiliated Schools conference last Friday and Saturday. The conference brought together representatives from Temple and Penn State universities to discuss the issues addressing their campuses like diversity and community relations and to share tips about what strategies have worked. The representatives from Lincoln University were unable to attend due to an unknown accident. Part of the conference focused on comparing how each university handles student affairs and student life and seeing where each had success. The representatives split into groups and shared ideas with each other, looking into how each university’s student government functions. The conference also included a review of state legislation to see if any upcoming bills warranted student governments taking action, such as letter writing or raising awareness on campus. Dall said the student governments are currently still researching legislation and setting action items. Dall and the other Pitt representatives also found time to give the other representatives a tour around Pitt. 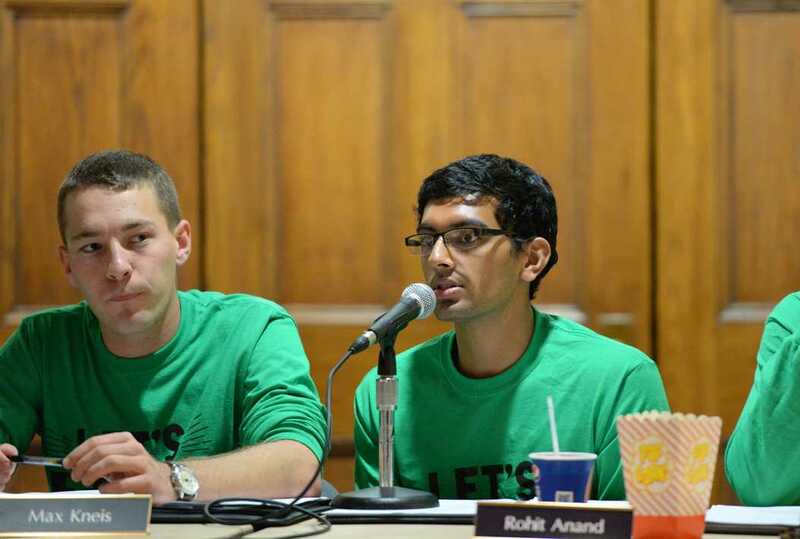 At this week’s meeting, the Board members represented Mental Health Awareness month with matching green shirts declaring “Let’s Talk,” Pitt’s new slogan for mental health awareness. As part of the month, students are encouraged to pick up a free shirt from the seventh floor of the Union and wear them every “Talk About It Tuesday.” Mental Health Awareness Week is Oct. 10-13 this year. The week will include a speaker and other interactive programs to educate students about mental health. PIST Skiing and Snowboarding requested $3,450.00 for transportation to their annual Stowe trip. The board approved in full. PIST Skiing and Snowboarding requested $3,450.00 for transportation to their annual Killington trip. The board approved in full. The African Students Organization requested $2,200.00 to bring a comedian to Pitt for their upcoming comedy night event. The board approved in full. Pitt Tonight requested $1,223.38 for funds to attend the annual College Broadcasters, Inc. conference. The board initially moved to approve funding for two registrations but after discussion decided to approve in full.